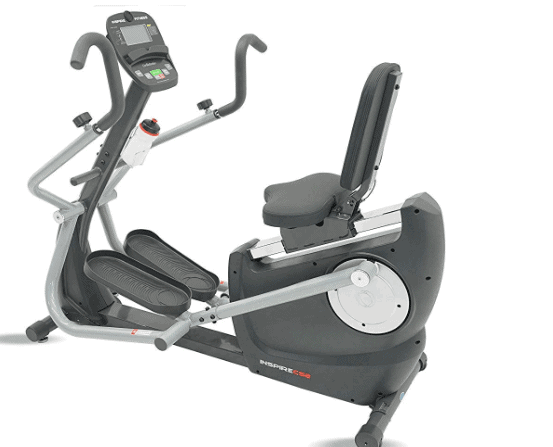 Inspire Fitness has floated different models of the CS Cardio Strider, namely, CS2.5, CS3, and CS4. Each of this Inspire Fitness Cardio Strider model has differences in terms of features and cost. Every upgraded model has more features than the previous model and of course, costs more. That said, the Inspire Fitness 2.5 (CS2.5) Cardio Strider is the least model at the moment. It has a sturdy construction that supports 300 pounds/136 kg maximum user weight capacity. This Cardio Strider offers an advantage in terms of what comes out of your wallet or bank account because it costs less than the CS3 & CS4. It is a recumbent elliptical machine that provides low impact full body cardio workouts that leave you satisfied and fulfilled. It has a fully adjustable seat and handlebar; therefore, users of different heights will be accommodated conveniently. The large console features 8 preset workout programs and an LCD monitor that displays and tracks Watts, Distance, RPM, Calories Burned, and Scan. You also have the liberty to toggle between Miles and Kilometers. The Strider is integrated with silent Poly V Belt drive system that ensures operation is quiet and smooth while the electromagnetic resistance system offers 20 levels of resistance. This recumbent elliptical machine is designed for home use only unlike the CS3 & CS4 that also supports light commercial purpose. Moreover, this unit does not have any pulse rate function at all. No EKG sensors and does not have telemetry capability. Therefore, if you wish to monitor your heart rate and be able to maintain your target heart rate zone at all times then you may have to purchase any of the upgraded models or consider purchasing an external heart rate device. Click right here to have a view at the discounted price of the Inspire Fitness 2.5 (CS2.5) Cardio Strider on Amazon. As aforementioned, the Inspire Fitness 2.5 (CS2.5) Cardio Strider has a frame that is made of solid steel which makes it unarguably sturdy. It supports 300 pounds/136 kg maximum user weight capacity. It is designed to offer low impact full body cardio exercises because of the integrated movable handlebars and the large anti-skid pedals that provide 12-15 inches stride length depending on the feet position placement. It is not a typical compact unit neither is it too large to overwhelm your space. Its overall assembled dimensions are 60 inches long by 35 inches wide by 50 inches tall. Therefore, the workout area that is required for this machine would be 5’ long by 2’9’’ wide and in a room that has a ceiling height of at least 7 feet high. You must also consider adding extra clearance of least 1 foot at the rear and on each side of the machine for safety and convenient workout experience. It is a very stable unit that doesn’t wobble or move, even during an intense workout. Its stability is as a result of the well-framed bases and its overall weight. The machine is equipped with front and rear stabilizer bars that are made of rounded steel and it weighs almost 200 pounds. There are two adjustable levelers at the front stabilizer bar which enable the user to level up the unit when used on a surface that is not even. By the way, it has transport wheels at the rear base that makes it possible to handle only 1/3 of the weight during the relocation process. It could be a good idea to place the unit on a protective rubber mat to prevent sweat from spilling on the floor and to further make it stable especially if you have a tiled or a wooden floor. There are footrests that are welded onto the console mast right below the water bottle so that one can take off the feet from the pedals while exercising in order to work out the upper body only. In other words, the CS2.5 Strider allows you to work out the upper and the lower body simultaneously and separately. Finally, it is worth to mention that the machine has an easy step-thru design that is great for folks with disability or old age. The Inspire Fitness 2.5 (CS2.5) Cardio Strider is equipped with an adjustable recumbent seat that is padded enough to convey the comfort that enables the user to workout longer. However, it is not contoured and as thick as the one on the upgraded models but it is still a good seat. Its backrest reclines into 3 positions; again, the adjustment is not quickly done as the one on the CS3 & CS4. You will have to dismount the strider in order to adjust the backrest. The seat could be adjusted fore/aft while the height is adjusted at the same time. Differently put, when the seat is adjusted backward the height increases and when it is adjusted forward the height decreases. The seat with the backrest provides comfort and good back support that allows you to exercise with aggressive thrust. The CS2.5 Strider only has a set of moveable handlebars unlike the CS3 & CS4 that have a set of moveable and static handlebars. The handlebars on this machine are adjustable both vertically (upward/downward) and sideways. This means that the handles could be flipped to switch workouts that target the chest, back, bicep, and tricep muscle groups. The pedals are not adjustable but they are large with plenty of room that eliminates stress in the ankle. They feature an anti-skid design with a 1-inch border that ensures safety and comfort during workouts. The pedals’ stride length is 12-15 inches depending on where the feet are placed or positioned. The Inspire Fitness 2.5 (CS2.5) Cardio Strider features a silent Poly V-Belt drive system that provides smooth and quiet operation. This means that you could work out and still enjoy watching your favorite TV show or listen to good music without amplifying the volume so high. Moreover, the family and the neighbors won’t feel bothered by your workout activities with the unit. The drive system is also maintenance free, no further maintenance is required. The drive consists of elements such as the belt, the pulley, and the perimeter weighted flywheel that is believed to be 20 pounds/9 kg. The Inspire Fitness 2.5 (CS2.5) Cardio Strider is equipped with an electromagnetic resistance system. This type of resistance system is frictionless and therefore, no wearing parts, and no maintenance required either. There are 20 resistance levels available and adjustable via the console, nice and easy. 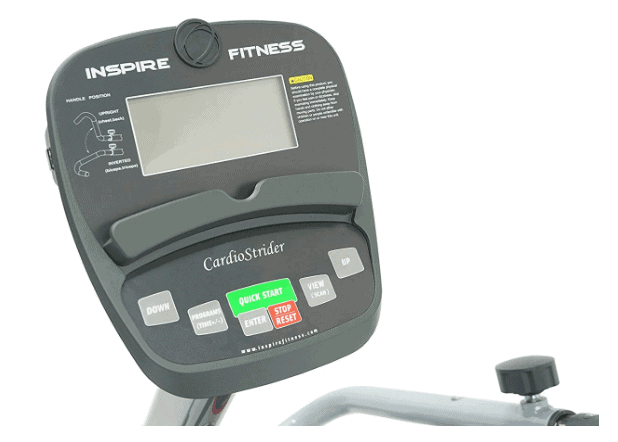 The console on the Inspire Fitness 2.5 (CS2.5) Cardio Strider features several navigational buttons, 8 preset programs and an LCD monitor that tracks Watts, Distance, RPM, Calories Burned, and scan. If you had noticed, the display doesn’t show the pulse rate. This is because the machine is not equipped with that functionality. Therefore, you must either purchase the upgraded model or get an external pulse rate device if you wish to monitor and maintain your target heart rate zone. By default, the monitor displays the workout data one at a time after a few seconds and continuously. You can also decide to set up a preferred workout data to display constantly without changing to another. The 8 preset programs include 6 total-body (rolling hill, peak, plateau, mountain climb, hill interval, and strength interval) and 2upper body (upper body focus and arms focus). It also features the Quick Start Manual Mode that allows you to skip using any preset program and just workout. There is a built-in tablet holder on the console for item placement, such as a tablet or magazine. The console is electric powered and uses an AC adapter which is included in the package. There are two accessories on the Inspire Fitness 2.5 (CS2.5) Cardio Strider which are the tablet holder and the water bottle holder. These accessories are relevant and important when it comes to an enjoyable and productive workout. The tablet holder allows you to keep a tablet device or a magazine on it, while the water bottle holder makes it possible to keep water within reach in order to stay hydrated throughout the entire workout session. The storage of the Inspire Fitness 2.5 (CS2.5) Cardio Strider will require a space area of 5’ long by 2’9’’ wide. It is recommended not to be stored outdoor, therefore a covering won’t be necessary. It is a heavy machine that weighs almost 200 pounds but it is integrated with transport wheels at the rear base which makes the relocation process easy regardless of its weight. The cost of shipping the Inspire Fitness 2.5 (CS2.5) Cardio Strider depends on the vendor you are purchasing from. However, some vendors such as Amazon provide free shipping and delivers within days of order placement. The unit is delivered partially assembled; the major components such as the drive and the resistance systems are already in place. There are only a few parts to be attached to the main unit of the machine by you such as the front and the rear stabilizer bars, the pedals, the console mast, the console, and the handlebars. The assembly takes about an hour, more or less to complete. The Inspire Fitness 2.5 (CS2.5) Cardio Strider is basically maintenance free because it has a belt drive and electromagnetic resistance systems that do not require any form of part replacement, lubrication or adjustment. You only need to examine the unit before use for any loose or broken part in order to avoid an accident or further damage to the machine. Finally, ensure to keep clean from dirt and sweat before and after use. The Inspire Fitness 2.5 (CS2.5) Cardio Strider is a recommendable indoor physical trainer for everyone that wishes to lose weight, improve fitness level, or recovery from any type of physical injury that has to do with disability. It is also good for the elderly because of its step thru design and low impact cardio it provides.